Getting from point A to point B has never been easier and yet it’s about to become just a little bit easier and faster for both iOS and Android users. 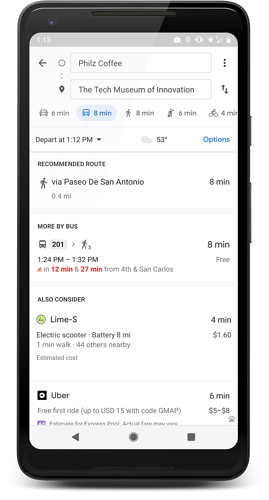 Just before Christmas Google Maps and Lime teamed up to help you travel the last mile. The feature that has already been rolled out in 13 cities around the world lets Google Maps users see nearby Lime scooters, pedal bikes and e-bikes as a transportation option right from the navigation app. Just type in your destination and tap on the transit icon to see your nearby options. If a Lime vehicle is available, Google Maps will show you how long it’ll take you to walk to the vehicle and estimate the cost of your ride as well as the total journey time and ETA. To see the exact location of the vehicle or to unlock it, tap on the Lime icon and you’ll be taken directly to the Lime app (if you don’t have the Lime app installed, you’ll be taken to the App or Play store). So far the feature has been rolled out in Auckland, Austin, Baltimore, Brisbane (AU), Dallas, Indianapolis, Los Angeles, San Diego, Oakland, San Antonio, San Jose, Scottsdale and Seattle but more cities are on the way so stay tuned. If you're a Google enthusiast like us, you'll probably also like our blog about the Google Assistant in Google Maps. Just hit the green button below to read more.